Guys, it’s a purge (…as I think I’ve said a few times…) – What's Up With Francis-Church? I’ve been saying it for some time. This is their time to get rid of us. There are so few Catholics left who believe what the Church teaches that it shouldn’t really be that hard for them. But make no mistake. They understand exactly the same thing that we do. The sides have lined up. There is no pretense at all now of trying to convert anyone. They know full well that the work they have done for the last 50 years in the Church to undermine and misinform, to dupe and deceive and lull to sleep as many as they can is now complete. All the ones who can be corrupted have been corrupted. The ones that are left – us – are the ones they know they can’t get to. The only thing left to do now, therefore, is get rid of us. Some of them are now admitting it openly. 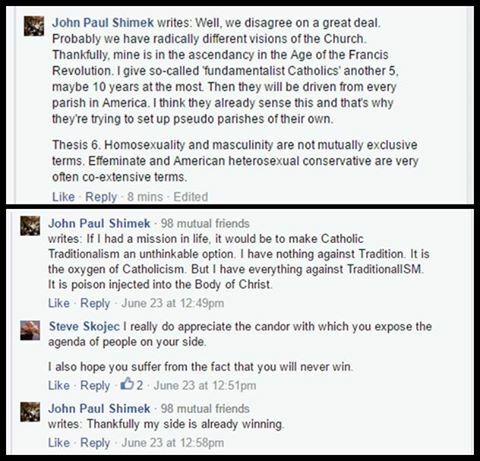 This John Paul Shimek character is someone who has previously touted himself as a “conservative” and boasts that he is a major figure in advising bishops and cardinals in the US, as a writer on Catholic issues he has been published by some of the leading Catholic “conservative” magazines. Lately his homophilia has come to the fore, perhaps because he feels now that there is sufficient space for such ideas under the current regime. Recently, our friend Steve Skojec made public a screen cap of a conversation – one of many… Steve actually seems to like talking to such people – in which Mr. Shimek, being somewhat less clever than he thinks himself, came right out and said it. Make no mistake; this is what the mainstream “conservative” novusordo world wants. They don’t want your salvation. They don’t want your good. Your eternal destiny is irrelevant to them, if they even believe in such things. Novusordoist “conservatism” is entirely and completely a fraud, and the work they are currently engaged in is to “drive” people like you and me “out of the Church.” They don’t really seem to have any notion of the supernatural realities of the Faith or the Church. For them perhaps it is some kind of club that they would like, for some reason, to have to themselves without difficult people like us around. The fact that these people have already clearly left the One Holy Catholic and Apostolic Church, the supernatural community of the Faith founded by Christ for the salvation of the world, seems never to have crossed their minds. They are incapable of anything other than purely naturalistic, materialistic thought. To them the Church is merely an earthly collection of like-minded people. Frankly, I can’t really understand what the appeal of a de-sacralized Catholicism could be. I have trouble figuring out what they imagine the Church is or what it is for, or what “salvation” means to them. I’m not sure there is much to be gained in putting the effort into figuring it out. I’ve had conversations with Shimek myself and the guy can’t string two coherent thoughts together. Figuring out what he “means” is like trying to figure out the meaning of the “word salad,” the disconnected blithering of a schizophrenic. The very disconnectedness of their thought, apparently, is taken among them as a sign of “profound spirituality.” The fact that nothing either Shimek or Francis says makes any sense is, in novusordoland, considered a “feature, not a bug” as our computer buddies like to say. And yet, what we want for them is their salvation and eternal happiness. Nope, no charity under here. Pingback: The Purge: Maltese priests to lose faculties if they refuse to Communicate unrepentant adulterers – What's Up With Francis-Church? Trackback: The Purge: Maltese priests to lose faculties if they refuse to Communicate unrepentant adulterers – What's Up With Francis-Church? Established a due date Most competitors know six months time in advance any time their subsequent fight is going to be. They use in which as being a strategy to spend on their valuable training for your next 8-12 2 or 3 weeks. FIGHT Workouts are not any different. Arranged a unique objective and provides yourself a time-scehdule that you will plan to achieving that intention. Preparing a contract has become the most beneficial strategies for but not just assembly MMA Training pursuits, but probably turning into more streamlined at accomplishing any kind of goals in life, whether they happen to be MMA Routines, weight loss, filling out task management at work, or any type of various personal approach. Surely you have noticed that the concept of “salvation” has become redundant over the last 50 years? Even JPII taught erroneously that “We do not know if there is anybody in Hell”, and promoted the work of Hans Urs von Balthazar which endorsed a practical “universalism” or “Origenism” and which has taken hold throughout the western Church at least. BXVI did nothing to correct these errors as he was also a disciple of HUvB, and Francis has positively promoted them. The Novus Ordo lalaland champions them through its heroes like Robert Barron who is supposedly a “conservative” Catholic. Thus Catholics are labelled as harsh, judgmental, cruel, intolerant, bitter, vicious, poisonous, “animals”, stone-throwing Pharisees and everything else which the Catholic-hating Francis and his new co-religionists throw at us. The novusordoists have sold the pass – the truth has been thrown over for a new false assurance of salvation for everybody. An old protestant heresy has been resuscitated in a new guise, but an old protestant heresy is exactly what it is. Should we be surprised that a protestant Pope is going out to Sweden to celebrate the birth of protestantism in a few months? Very sad that Mr. Shimek doesn’t have a mission in life and that he would choose what he said if he had one. His mission in life is the same as that of all of us: to glorify God and to save his soul and the souls of as many people as possible. RE: Lorraine’s comment: Often I’m reminded of what Our Lord said, that there would come a day when they will put you to death thinking they are doing something good for me. Lorraine, I’m afraid you are spot-on in your comment to Hilary’s excellent post here. The time is coming fast I’m afraid where catholics (intentional lower case c) will be gleefully working with the secular authorities to turn in faithful Catholic priests, religious and laypeople here in the U.S. and elsewhere. This will be the new form of “social justice” and sadly, Bergoglio gave the nod for this over the weekend with his diabolical statement that the Church should apologize to homosexuals. Even if the most faithful Catholics were to apologize, that wouldn’t mean one iota to those people. The progressives in and outside the Church hate the Catholic Church and its teachings and are hell-bent on destroying it. I’m afraid we’re at the point of no return culturally in this country and the only thing that can save it is a purification designed by God Himself. I saw a study recently where something like 40 percent of millenials support editing the First Amendment to the U.S. Constitution so that “hate speech” can be suppressed – that is not good and especially not with the likelihood that Hillary Clinton will be the next president and perhaps Elizabeth Warren, the VP. This thinking by the young of today’s America is the direct result of what they’ve learned from the progressives in the public schools and on college campuses which their parents have not bothered to notice. Almost overnight in this country, homosexuals and now trannies have become a legitimized civil rights group and any efforts to curb their agenda is met with viscous accusations of “hate speech.” Well, I’ll clarify that… the “hate speech” accusation is only reserved for Christians, the muslims are excused because any criticism of muslims is RAAAACIST!!!! The next step in this agenda is the criminalization of any type of criticism or conversion of the GLBT people (and yes, that includes COURAGE). Sadly, Bergoglio, his bishops and their priests I’m afraid will be lock-step in agreement with this based on recent examples. So, at what point during the Triduum do you think Satan stopped cheering and finally figured out he lost? When you scratch their hypocritical surface, you will find the most malicious and vicious Catholics. They hate us. Francis hates us. The papacy of Francis has empowered them. I began t notice on places like CAF how otherwise moderate liberal Catholics were beginning to get downright nasty once Francis was elected. Then I realized they always were like that but were just biding their time. They do that well – bide their time. Often I’m reminded of what Our Lord said, that there would come a day when they will put you to death thinking they are doing something good for me. I’m obviously paraphrasing, but I’m sure you know the verse of which I write. Yes, it’s a purge. Well said. So, so much is being revealed. Steve was, as usual, spot on. They can’t win. They can only appear to. I have heard priests preaching a mission in my old novus ordo Church (many years ago now) deny the salus animarum explicitly. I remember people walking out. Would people walk out now? Given the simplistic view of papal infallibility most Catholics have after 50 years of faulty or non existent catechesis I sincerely believe not. Pope Francis is not confirming people in the Faith, he is confirming people in their sins. As you are fond of saying yourself “Come sweet meteor of death”! Not shocked by Shimeks candor at all…not able to attend the TLM as of late, been relegated to attending Novus Ordo mass on Sunday’s due to caring for an elderly mother in law, the priests and parishioners are in a world all their own and it has little to do with the salvation of souls or their last end. LIFE IS GOOD is their motto and we Trads are those prickly things that get stuck on your clothes when you go wading through the brush.